We arrived in Mbale on July 25th after a day of travel. Mbale is in eastern Uganda, near the Kenyan border and at the base of Mount Elgon. Moreen and Moses from the Uganda Women’s Advocacy and Development Services (UWADS) met us at our hotel that evening to brief us on the day ahead. Both were full of energy, and the short meeting left us excited about the day ahead. Their project has strong similarities to RUGLI in Kasese in structure and sustainability which filled us with optimism. Moreen and Moses arrived shortly after 10AM the next morning to take us to the UWADS office to see where they work and also offer computer skills training courses. After a quick tour, we headed out to the site of the community baking project. UWADS runs a number of different projects in 15-20 villages around Mbale. Though not something we had thought about during our homestay with Mama Ali, baked goods are not common in Uganda. Most families cook meals outside over an open flame, and an oven or even knowledge of baking is the exception rather than the rule. During our drive to the site, we learned how intentional Moreen and Moses had been both in choosing the project and the specific community in which to begin their baking initiative. The baking program, which Rockflower supported by funding the construction of a wood-fired brick oven, is located in a nearby village with many young mothers. The average age at which women have their first child here is 14 years old. These women may or may not have husbands and, in most cases, they have little to no financial independence or support. A critical component of success we identified in the projects we visited is a path to self-sustainability. The initiatives that begin with group saving schemes have found a solid financial footing from which to grow their programs, and the UWADS baking program is no exception. The baking program started by encouraging women in the village to save whatever they could each week. As they built their group savings, they established leadership roles (treasurer, secretary, and chairperson) and began lending money to members when they needed a loan. The loans could be used to buy food or pay school fees for their children. For the baking project to succeed, the group of women needed to have marketable skills, skills that UWADS focused on developing before helping the women start a business. Along with computer literacy, UWADS offers a program in financial literacy to help empower women to be financially independent. With the savings program in place, this group of 20 women already had a community, buy-in, and ownership. The next step was finding a way to generate revenue. UWADS, namely Moreen and Moses, provided baking classes and an oven. Because most people cook over a wood or charcoal fire, they have no experience with baking. Additionally wheat is not a significant crop here, so most Ugandans are more accustomed to working with corn or millet flour than wheat flour. Consequently, baking is a marketable skill. Through the baking class, UWADS has trained 20 women in how to bake bread and rolls, donuts and mandazi, cakes (more like muffins) and chapati. The women and girls meet twice a week to bake and then take turns selling their products at the market. Profits come back to the group to help buy more supplies or go into the group savings to provide loans to members. On the days not devoted to group baking, members can bake on their own and then sell the products and keep the revenue. They have access to the community oven and can take out loans to help pay for baking supplies. Women in the group are using these skills and the income to pay for their children’s school fees, buy food and make food for their families. Just as importantly, they’ve built a proud, empowered community. They are also sharing their knowledge of baking with other women and expanding the community. Watching the group work, we were struck by how lucky they seemed. They have an incredible space where they work and have built their wood-fired oven. In the community, there is a generous man who owns a large building along with a covered pavilion that he allows the women to use to prep their products. The oven is located behind the building, so it is a perfect communal space. Of course, this was not chance, but the result of Moreen and Moses careful planning. More than luck, though, what we noticed was the spirit these women possessed. They were enthusiastic, they were empowered, and they had a strong group identity. They loved the work they were doing and they loved working with each other. Throughout the morning, we watched women and girls roll out doughs, cut out donuts and fill muffin pans. We had the chance to talk with a number of them and were inspired by the energy and optimism of the group. A few of the women had the opportunity to introduce themselves more formally and speak to what the baking project means to them. Seeing the confidence they had developed to stand up in front of a group and share, in English, what learning these skills means for their independence was inspiring. After sharing a little bit about our work with Rockflower and the opportunity to visit with many of our partners in Uganda we were treated to a performance by the local brass band. The brass band, much like the baking project, is not typical. The community supports young boys and girls learning to play instruments. The band performs throughout the year, and income generated by those performances help pay the children’s school fees. Before leaving, we were able to enjoy a meal with all of these different community members and sample the baked goods. We left Mbale feeling optimistic about this project, both because of the lives it has already so clearly impacted as well as for the clear path to sustainability and expansion. After a joyful and engaging morning with Hope for the Future, we said goodbye to Gertrude, Tonny and their members and headed back to Mill Hill Missionaries Home to begin our second visit. We had arranged to spend the afternoon and evening with Robertson Haggai from Rainbow House of Hope at the top of Nsambya Hill. Kampala, once called the City of Seven Hills, now sprawls over more than twenty-one hills. Traditionally the hills identified different regions of the city and Nsambya Hill has long been home to Catholic missionaries. Rainbow House of Hope (Rainbow House) is located near the top of the Hill with views of the Makindye Division slums to the south. Founded in 1998, Rainbow House introduced music and sports programs as a means of getting children from the slums off the streets. The whole operation consists of one building and a series of retrofitted shipping containers that serve as workshops for their different programs, which includes a brass band for children and young adults, skills training in hairdressing, wood and metal working, tailoring, knitting, painting, sign-making and computer literacy. This all falls under the direction of program coordinator and Rainbow House founder, Michael Mwase. Recently, and with support from Rockflower, Robertson has begun a Slum Maternal Health and Skill Development program. Robertson and a small team of community mobilizers work to get women from the slums of Kampala to Rainbow House’s maternal health programs. Along with conveying important information to these women, the programs help to create community among a largely disenfranchised population in the city. Along with their outreach programs, Rainbow House has installed a clinic that operates periodically (once every month or so), during which women, girls and children can be seen by volunteer medical personnel. The two doctors and one nurse who support the clinic take days off from their local, private hospital positions and donate their time to make the Rainbow House clinic possible. They offer maternal health classes and workshops, as well as examinations and evaluations. While the clinic is extremely limited in terms of equipment, medications and facilities, it was very impressive to see these doctors and nurse, younger than we are, working passionately with this population and determined to do their best to support this community and program. The clinic operates out of a second Rainbow House building located a few minutes walk from the top of the hill. When not hosting the monthly clinics, it is home to a preschool and can also provide accommodations to Rainbow House volunteers. Our visit coincided with a clinic day, so after a quick introduction to the program, we walked with Robertson down the hill to the clinic to meet the volunteer doctors and clinic attendees. The clinic was packed and patients of all ages, who had to wait hours to be seen. While patients waited, Rainbow House volunteers served a simple lunch (beans and posho or rice) that was probably more food than many of the people typically ate in a day. We particularly enjoyed the chance to get to know and speak with Dr. Fredrick, who together with Robertson, has worked to develop the maternal health program. Having come from very little himself, he is grateful to many people who helped him become a doctor and the successful person he is today. Because of his experience, he believes fundamentally in the need to give back and help those in his country who experience extreme poverty. Following lunch, the clinic attendees gathered and Robertson introduced us and explained how Rockflower support has enabled this program to become a reality. It was eye-opening for us to see the wide range of women there: some were there with several small children in tow, some very sick, others very pregnant. All of them were grateful for the opportunity to be seen by doctors. For many, there is no alternative to this clinic. Going to a private hospital is prohibitively expensive, and the public hospitals often do not have space or sufficient staff to attend to those in need. The work of this clinic fills a critical need in the community. Following our visit to the clinic, Robertson and Teddy took us on a walking tour of the neighboring slums. The alleyways we walked along were filthy; filled with sewage and waste. We followed Teddy and Robertson down narrow passageways between decrepit buildings, sometimes jumping from rock to rock to avoid the puddles. This experience was easily the most challenging part of our time in Uganda. We did our best to lean into the discomfort we felt, as we sought to understand the reality of life in the slums while simultaneously acknowledging to ourselves the stark contrast to the privilege we experience and to which we are accustomed. Along our walk, we visited three different women connected to Rainbow House. Each of them opened up to us and gave us a glimpse into their lives and the circumstances under which they live. Two of the women we visited at their homes - very small, one-room flats. In both cases, and consistent with the generous spirit of Uganda, they welcomed us into their tiny homes. One woman bought a pineapple being sold by a man in the alley and insisted we eat it with her. We were not her guests until she gave us something to eat, she said. The strength of the human spirit is amazing, as this woman with so little insisted on sharing what little she had with us. The third woman we visited was a widow and mother of three. In her late 20s or early 30s, we visited her on an alley corner where she operates a small shop (a few racks of vegetables and a few other staples). This shop is her sole source of income and it is illegal; she does not have the required permit to operate. As such, if the authorities come they will confiscate the produce and other products she sells. That happened to her last year, forcing her to find a new corner, which she must rent from the owner of the corner building, and start over again. She cannot afford school fees for her children, but she uses what she makes to feed them. She also can not afford to leave her shop to attend Rainbow House programs, though she says she would if she could. Despite the determination and spirit of Ugandans, the circumstances of life here are devastating. There is a critical need for community-based organizations like Rainbow House, which provide so many programs to empower Ugandans with skills so that they might lift themselves from extreme poverty. Even so, it is not possible for Rainbow House to reach and support all those in need in the Makindye Division slums. Rainbow House programs are often at capacity and, even if they were not, many women like this widow would still not be able to take advantage of them. As we left the slums to walk back up the hill to Rainbow House, we felt keenly the uphill battle Michael, Robertson, Dr. Fredrick, Teddy and others here face in bettering this community. Despite working tirelessly, there is still infinitely more work to be done. In our conversation with Michael, Rainbow House founder, he shared a bit about his life growing up in the 1970s while Idi Amin was in power, a particularly dark period in Uganda’s history. Being around kids, and knowing what it is like to have nothing motivates him to continue improving the lives of others in his community. Having spent the day in the city, we were also able to reflect upon the differences between poverty in the cities and in the villages we have visited. In villages, families survive on what they can grow and often live in a small mud house. That can come to look fairly comfortable in contrast to the small one-room homes with sewage-filled alleys that flood during the rainy season. In the slums, there is nothing remotely close to clean water and nowhere to grow a single plant. People often leave the villages hoping for better lives in the city, but it seems the reality of village life, with the community and perhaps larger family support found there, would be preferable to the slums of the cities. The need for the Slum Maternal Health and Skill Development program Rainbow House is developing is great, and like so many organizations they face funding challenges as well as societal and cultural barriers to accessing the communities and women in need. Yet it is the unrelenting optimism and faith in these communities and people that Robertson, Dr. Fredrick and others bring to their work that makes these programs possible. Their dedication, resourcefulness and persistence allow them to defy the odds and make programs like these a reality. We spent much of Monday, July 23rd, traveling from Kasese back to Kampala. We opted for the southern route instead of the northern route that we took when we traveled to Kasese. While slightly longer, the southern route took us through Queen Elizabeth National Park and across the equator. Perhaps a silly extravagance, it was hard not to take advantage of being so close to new experiences. Traveling with Zahara has made us very much aware of our privilege. Despite having been in Uganda for less than two weeks we had traveled farther around the country than many Ugandans would in their lifetime. On the 24th we were scheduled to visit with two partners located in Kampala. After the invigorating trip to Kasese, we were excited to see more of the work being done by our partners. In the morning we would spend time with Hope for the Future before spending the afternoon with Rainbow House of Hope. At 9AM we arrived at Hope For the Future’s small workshop, where we were greeted by women of all ages. The shop was packed full of treadle-operated Singer sewing machines with no passing room between machines. Each machine had at least one woman at it. Still other women, who were not working the machines, spilled out onto the sidewalk, sitting in chairs or on the ground, practicing their hand sewing and embroidery. The treadle-operated machines are pretty standard here, as electricity is a luxury for many people in Uganda. Though the shop is typically not this crowded, the women involved with Hope for the Future wanted to be there to greet us. We have consistently been greeted with open arms by everyone we have met. The people of Uganda are so open and welcoming and it is really a refreshing breath of humanity. 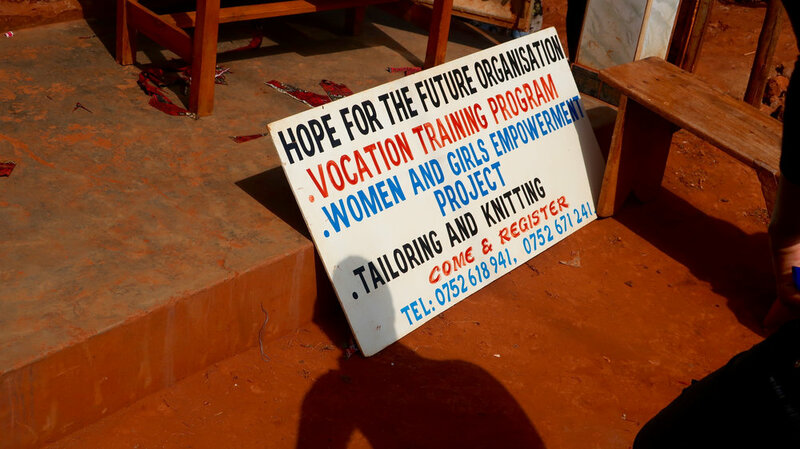 The mission of Hope for the Future is to provide women and girls the training and development of skills (tailoring, sewing, and knitting at this point) that they can use to find jobs. However, like many grassroots organizations, Hope for the Future is fighting an uphill battle against the reality of their situation. Because their programs are fully enrolled, with two sessions per day, there is no opportunity for women to use the equipment after their training is complete. For most women, buying a sewing machine and fabric is a prohibitively expensive investment, so working independently is not often an option. While the women have skills and may be employable, if they are able to find a job, they may still be beholden to abusive and/or corrupt bosses. We have been impressed by the articles of clothing women in Uganda are capable of producing. Given that the society we come from is one in which anything one needs can be bought in a store or ordered online, it was refreshing to see quality products being manufactured by hand. The traditional patterns of African fabrics are typically bright and cheerful, much like the Ugandans themselves, and the result is beautiful clothing. We saw dresses in various states of assembly at the sewing machines, while the finished products, the results of tailoring classes and additional work, were hung up and for sale all around the shop. Their work would be right at home in a high-end clothing boutique in the United States, fetching far more in dollars than they do in shillings here. One trend that was abundantly clear from our visit is that the number of students in each class decreased as their age increased. As children get older, their responsibilities increase at home (if they have one), and so do their school fees, making school at best a challenge or at worst inaccessible. Though many of Jack and Jill School’s oldest students pass the entrance exam to continue onto secondary education, only about 20% are able to come up with the funding to attend. Hope for the Future is working to fill this gap by providing skill training which will provide an opportunity for their students to find employment and earn a living. While we were unable to meet with the head of Hope for the Future, Rose, on the day we visited, we enjoyed the opportunity to engage with Tonny and Gertrude. Tonny is one of two men that work with the organization as ambassadors. They recognize the need for men to be engaged in the work of empowering women. Gertrude was running the tailoring classes we visited and coordinated our visit. We were so impressed by the women we met. It was clear in the way they interacted with each other that they had built a community in that small shop and were eager to help each other out. They very quickly welcomed us in and gave Emily a dress that had been made by their students. This was beyond generous, but if we’ve learned one thing on this trip it is that the Ugandan people are generous with their time, with their kindness, and with whatever they have that can be shared. Saturday’s whirlwind continued in the late afternoon with a visit to the Rwenzori Women's Initiative for Community Development (RWICOD). Rockflower funded RWICOD to build a grain mill for the local community. We had learned the significance of work like this during our time at S.O.U.L. Imagine for a moment having two 50 kg sacks full of corn. This corn is going to sustain your family for the months between the growing season, but not in its current form. The corn needs to be milled into cornmeal which can then be stored and consumed. Now, what if the nearest mill is 5 miles away? 10 miles away? With no mode of transportation, this becomes a significant investment in a family’s time and resources to figure out a way to get the corn to the mill and back. Often children have to take time off from school to help haul the grain and the physical toll on mothers is tremendous. RWICOD was started in October 2002 by a group of women who saw a need for women to join hands to fight the injustices of poverty, disease, and violence. Because of its location, Kasese has been especially hard hit by these hardships. Women make up about of 55-58% of the total population in this region, and many women are widows as a result of the ADF (Allied Democratic Forces) war of 1996-2001 or the AIDS scourge, of which the Kasese district has one of the highest prevalence rates in Uganda. A great number of them are single mothers who having been rejected by their families, are living very hard lonely lives of exclusion, trying to take care of their children for whom they are the sole breadwinners. Through the construction and operation of a grain mill, RWICOD provides employment for women. The proceeds from the milling project can be used to start a revolving loan fund to enable women to diversify their income. Encouraging the women to work as agents in collecting grains, such as corn, will in turn allow them to earn a small commission or profit, through which they can improve their in living conditions. Buying their own grains, such as maize corn, dried cassava and millet, which can in turn be milled for them, will provide further opportunity for income generation. The 20 women involved have more than 50 children, who are also the direct beneficiaries of this work. Ultimately, the project is designed to serve the needs of over 200 Ugandan women, the majority of whom are within Kasese Municipality and are in real need of training and opportunity. Because of our experience living with Mama Ali, this project and the impact it will have on the community in Kasese really hit home for us. Part of what has made this trip such an amazing experience is the chance to put people and faces to these circumstances and see just how this work will impact them. The added depth and color we gained from personal connections has served to strengthen our desire to continue this work and bring more people into it. It was mid-July when we landed at Entebbe International Airport. We quickly found our new friend Muganda, S.O.U.L. Foundation’s volunteer coordinator, outside the little airport and headed right into afternoon rush-hour traffic in Kampala on our way to Jinja Bujagali. Despite some jet lag, the drive was a good opportunity for us to get to know Muganda, what he does with S.O.U.L. Foundation, and what the organization has meant to him since its founding. He was born and raised in a polygamous family with three wives, and he and many of his siblings have benefited from S.O.U.L. Once a S.O.U.L. sponsored student, Muganda attended university and now is a coordinator for the food security program, working on agriculture and aquaculture. S.O.U.L. 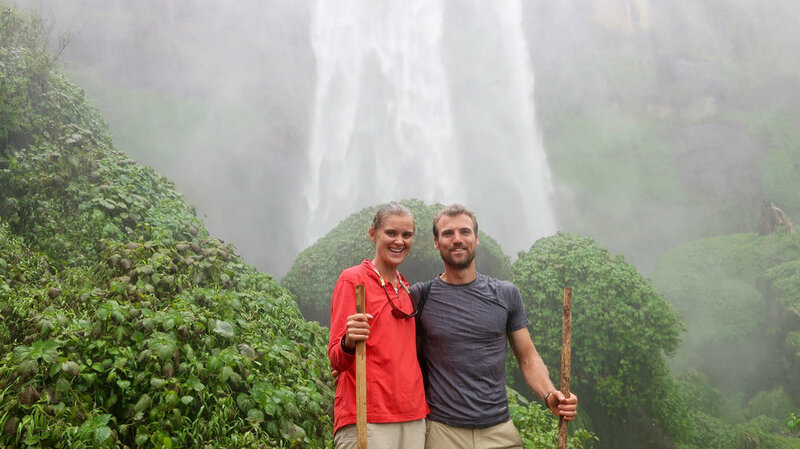 Foundation was co-founded by Brooke Stern Okoth and Ken Stern, Brooke’s father, who visited Bujagali Falls on a backpacking trip in 2009. Struck by the lack of basic necessities and amazed by the people’s spirits and enthusiasm, even in the face of extreme poverty, Brooke returned shortly thereafter to start S.O.U.L. Foundation. S.O.U.L. has grown a lot since then! With programs in education, women’s empowerment, maternal health and school sponsorship, we were excited to see their work in action. What we didn’t fully appreciate, though, was just how much we would learn and value our opportunity to stay in the home of a family that has been deeply connected to S.O.U.L Foundation since its inception. We arrived after dark in Bujagali Falls at the home of Mama Ali, one of the wives in Muganda’s family. She welcomed us with open arms and immediately started teaching us Lusoga, the local language. Most of Mama Ali’s six children have been sponsored by S.O.U.L. to further their education and are now adults. Her house is still full, though, of various children in her extended family. The young children come to live with her so they have better access to education and opportunities, in large part thanks to S.O.U.L. We really enjoyed getting to know her, her husband and children, and the extended family of children living with her. Her home was rarely quiet, with friends and family constantly passing through. We would ask Muganda how everyone was related and he would just say “it is the family forest”. The village is a tight-knit community, where the lines between family and friends seem oftentimes blurred. Our day to day experiences in Mama Ali’s home illustrated the extent to which this community is benefits from S.O.U.L.’s presence. We really enjoyed getting to know and spend time with Naima and Salima, two young children in Mama Ali’s extended family who live with her and are students at the pre-primary school S.O.U.L. Foundation operates. At age six, both girls are working members of Mama Ali’s household; they sweep the compound, fetch water, work in the garden and help with cooking, cleaning, laundry and any other chores that need to be done. Contrasting their lives to those of our young nieces, nephews and cousins at home was a constant mental exercise for us; toys and playtime are scarce in these girls’ lives, but they are happy, healthy and full of joy. The self-sufficiency and resilience of these kids is impressive; we rarely saw them cry or complain and were impressed by their ability to find fun in their work. These girls illustrated for us how, nearly from birth, women and girls play a critical role in supporting their families and communities. During our days at S.O.U.L we would sometimes see Naima and Salima at pre-primary school. The genuine joy on their faces, and those of their classmates was palpable. These students are eager to learn and grateful to be able to go to school. Without S.O.U.L. and Mama Ali, these girls might not be in school, and even though they attend S.O.U.L. pre-primary, there is no guarantee they will become S.O.U.L. sponsored students or that their families will be able to pay their school fees in order for them to continue their education. We saw in Mama Ali’s adult children, Zahara, Ali and Arafat, how access to education through S.O.U.L. has changed the trajectories of their lives. It has enabled them to pursue their dreams and support their family. Ali is a landscape architect, farmer and works with S.O.U.L.’s Agriculture Learning Center program in Bujagali. Touring his gardens and learning from him was a highlight of our time in Bujagali. Arafat supports himself as an artist in Entebbe. Zahara is studying to be a nurse and midwife. Thanks to S.O.U.L., these young adults are thriving, independent, empowered people who share S.O.U.L.’s values and are determined to improve the opportunities available to Ugandans like themselves. As Mama Ali and the children dried and processed corn to take to the maize mill, we felt the tangible impact having a maize mill in Bujagali has had on this community. S.O.U.L. operates the maize mill, employing women in the community who otherwise have very limited economic opportunities. During our week in Bujagali Falls, we visited the mill and were able to see it and its staff in action. Before there was a local maize mill, Mama Ali and others would still dry their corn, but they would have to take it to another village to be milled. Harvesting several hundred kilograms of corn, as many families do, means all that corn must be transported by foot or by boda boda (motorcycle) to a village with a mill, usually some distance (5 or more kilometers) away. The price in time and resources spent bringing the corn to and from a mill is very costly for these rural Ugandans, so the mill in Bujagali has been a tremendous benefit to the community. Community members may pay to have their maize milled either in shillings or with a percentage of the maize flour their crop produces. Women who work at the mill are paid for their hours and served a meal while they are working. In this way, S.O.U.L.’s maize mill is directly in line with two of Rockflower’s Five Keys: economic empowerment and access to food and water. Another impactful series of experiences we had while staying with S.O.U.L. were in conjunction with their maternal health program. As our Rockflower campaign was an effort to support this program, we were excited to learn more about it. Particularly for Taylor, as one of nine children, the importance of this program resonated with us. Our very first day at S.O.U.L., we worked with Bayo Jinnous, an ultrasound technician who travels a great distance (about 5 hours each way!) every Friday to come to S.O.U.L. to conduct ultrasounds for women in the community. We observed his work and spoke with him at length about maternal health and public health in general in Uganda. It was a great scene-setting experience for us, as women of all ages and education levels came for scans. Many had only completed primary school and many others only had a year or two of secondary school education. The cost of education - even the fees associated with the public schools - is prohibitive for many families in Uganda resulting in many children, especially girls, not finishing school. As part of the scan, S.O.U.L. asks the women whether they are attending antenatal classes at the local hospitals and gives them antenatal vitamins through a partnership with Vitamin Angels. A few days later, we traveled with Muganda to a nearby village to attend a maternal health education class taught by S.O.U.L. antenatal education instructor, nurse and midwife, Sophie Mutesi. We anticipated the class would be well-attended, but we were somewhat blown away as women kept coming, and coming and coming during the two hour class. The room was packed with women of all ages: some very young, some quite old, some with infants and all eager to learn as much as they could from Sophie. The course was taught in Lusoga, and even though we couldn’t understand the lessons and questions, the joy, camaraderie, community and support that come from these classes was apparent. This work empowers communities with knowledge, skills and confidence and makes Ugandan women, children and families safer and stronger. Also, when women complete the maternal health education classes with S.O.U.L., they are able to receive a “Mama Kit” which contains important supplies for a healthy delivery, such as gloves (to prevent transmission of infections and HIV), razor blades (to cut umbilical cords), soap, gauze to clean a newborn’s eyes, sanitary towels for the mother, a polyethylene sheet on which to give birth and a suction bulb to clean a newborn’s airway. That S.O.U.L. can offer the Mama Kits is a real motivator for women to take these classes, as they fully recognize the importance of these supplies in a healthy and safe birth. Our last visit specific to the maternal health program was with Muganda to meet Clementina, a local traditional birthing attendant. She studied nursing and midwifery in school and now, likely in her 70s, is renowned and beloved in the region for her work. She is inspirational, warm and an asset to Ugandan women and families. We visited her at her home where she has a small facility. S.O.U.L. helped her install solar lights and a water collection system for showers several years ago. Prior to that she had neither. Her small building has a birthing room with one bed and a recovery room with four beds. She welcomed us for tea and showed us her record books; she has recorded every delivery in her career. She seemed to average 60-100 births per month, which suggests she has delivered somewhere between 30,000 and 40,00 babies in her lifetime. She does not charge for her services, though women pay what they can afford, and she doesn’t take time off. At this point people will travel great distances to deliver babies with Clementina. She does not use much traditional medicine and Muganda shared with us that she considers the forest her lab, where she goes to collect various medicinal herbs. While she has been instrumental and critical in the greater community, traditional birthing attendants can be controversial. Without access to hospital facilities or reliable transport to a hospital, when a mother or baby requires additional medical care in childbirth, it can be difficult or impossible to get to a hospital. S.O.U.L. has another initiative to provide emergency transport for pregnant mothers to help address this issue and their support of Clementina has served to improve the safety of her work and facility. S.O.U.L. is planning to build a maternal health facility in the village, which will also help to address some of the safety and health issues around maternal health. While we were at S.O.U.L. we really enjoyed getting to know Hawa Nantege, one of the tailoring instructors. S.O.U.L. runs tailoring classes for members of the community (mostly women, but men do take the courses, too). Her students were working on their exams during our week there, completing a different piece of clothing each day during the week. We enjoyed watching them block out and sew shirts, skirts, childrens shorts and other items. Hawa also quickly saw in us people she could put to work making sanitary pads, and we were eager to help. Tailoring students and S.O.U.L. staff work hard to make “S.O.U.L. sister totes”, bags with a set of reusable menstrual pads for female S.O.U.L.-sponsored students. Without access to supplies or medication to manage their menstrual cycles, girls are often forced to miss or leave school because of their periods. Giving girls the supplies and confidence to stay in school is an important part of S.O.U.L.’s sponsorship program and we really enjoyed being able to do a small bit to support this important project. Students periodically need new totes as the pads do not last forever, so there is a constant demand to make more pads and any idle hands can be found tracing and cutting the different materials for the tailoring students and instructors to sew. We also got to visit S.O.U.L.’s new fish farm in the Nile River with Muganda. Muganda has studied aquaculture and started S.O.U.L.’s program. The first batch of tilapia were nearing a sufficient size to begin selling them. S.O.U.L. employs women in the community who come to feed the fish daily (~30-40 kg of feed!) as well as two other employees who help with security and maintenance of the four cages. A new venture for S.O.U.L., it was exciting to see a project with so much potential in its first iteration. We also visited the agriculture learning center in the village with both Muganda and his brother, Ali. With all sorts of crops, including kale and other greens, cabbage, squash, corn and bananas, the demonstration center shows community members both how to grow different crops and proves that some crops (thought to not grow in the region) can actually grow well. Both of these projects, as well as others the S.O.U.L. operates in another village nearby, serve to diversify the sources of food produced within and available to the community, as well as create a source of revenue for S.O.U.L. We learned so much and really loved our time in Bujagali with S.O.U.L. and Mama Ali’s family. Learning from and living with them really helped us contextualize and appreciate the challenges rural Ugandan communities face on a daily basis. While the work S.O.U.L. and Rockflower do already resonated with us, living and experiencing the need for community-based organizations like S.O.U.L. cemented for us the importance of empowering communities through education and economic opportunity. After a full and terrific stay in Bujagali, we were sad to leave but excited to get on the road and meet the other seven Rockflower partners in Uganda. What follows will be a series of blog posts recounting our trip to Uganda as Rockflower Global Ambassadors. To learn a little more about myself (Taylor Washburn) or Emily Chandler you can go to the Rockflower website. First, a little background on our trip and how we got involved with Rockflower. While teaching at a boarding school in Massachusetts, we were introduced to Tine Ward, the mother of two of our students - Fran and Lulu. For those of you who follow Rockflower, you will recognize all of these individuals for the incredible work they are doing on behalf of women around the world. Fran and Lulu introduced us to Rockflower, the not-for-profit investment fund founded by their mother. Rather than identifying and developing projects around the world to empower women and girls, Rockflower invests in projects and groups already on the ground, projects run by the very people they will impact. This model resonated with us as teachers because we have seen first hand how much more powerful and lasting intrinsic motivators can be compared to extrinsic motivators. Rockflower believes that investing in women is the key to global peace and prosperity. Their Five Keys are the fundamental framework which women and girls need to build prosperous and successful lives. This framework provides a holistic approach to addressing the most critical challenges facing women and girls within their communities and larger societies - challenges such as poverty, malnutrition, infant mortality, violence, conflict and lack of education. This felt like something we wanted to invest ourselves in and make a long-term commitment to. We reached out to Tine with a simple question, “How can we get more involved? Involved in a way that we can see the impact of the investment of our time and resources?” Our conversations with Tine led to the creation of the Rockflower Global Ambassadors. In this role we would work to support Rockflower and get a chance to go see some of the results of Rockflower’s investments first hand. This would be an opportunity not only to see that work up close but also for those organizations to have face to face personal interactions with Rockflower ambassadors. Our first project was to raise funds and awareness around Rockflower’s partner S.O.U.L. Foundation. We were able to reach out to some of the communities we have been involved in and saw incredible support for this project. We thought more about the value of these dollars and the impact they would have on these communities and we decided to ask guests at our wedding to redirect money for wedding gifts towards this cause. Again, we were awed by the generosity of friends and family. We were excited to be able to visit with each partner and also a little intimidated by the sheer volume of it all. The trip was made possible by the generosity of many and we are excited to share with you what we learned, both personally and as Rockflower Ambassadors.